A two week research trip to the famous Jurassic Coast, in Dorset, UK has revealed many interesting and thought-provoking fossils. 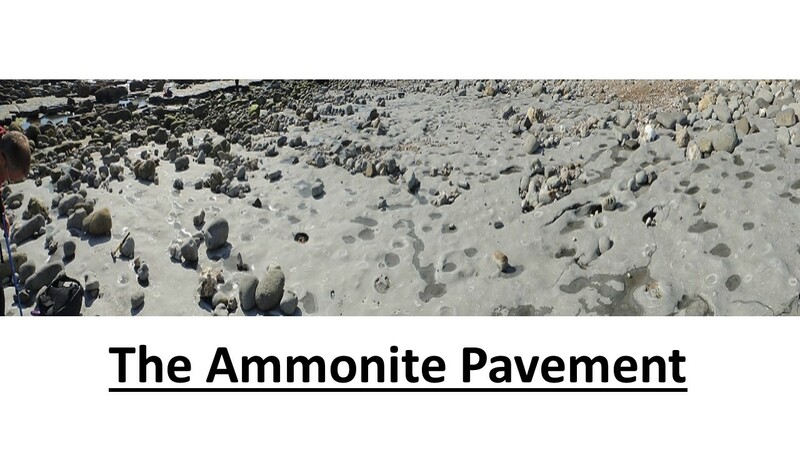 At Monmouth Beac h, Lyme Regis, we visited the “Ammonite Pavement”. This is a layer of limestone protruding out of the cliff at ground level, over a massive area, which is full (and I mean FULL) of ammonites and nautilus’. 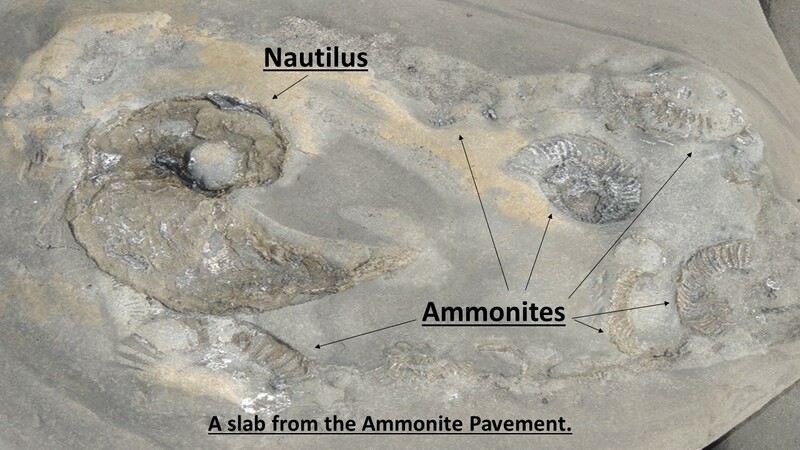 This is clearly Flood evidence, as there are so many ammonites in one area, with no apparent reason for death. Also bear in mind that the pavement is just one of the layers of limestone. There are up to 30 that we counted above ground level, going up the cliff, and many more under the ground, all full of fossils. This is a fossil grave yard! Nautilus’are also a “living fossil” – alive today and unchanged for a supposed 195 million years – no e volution! 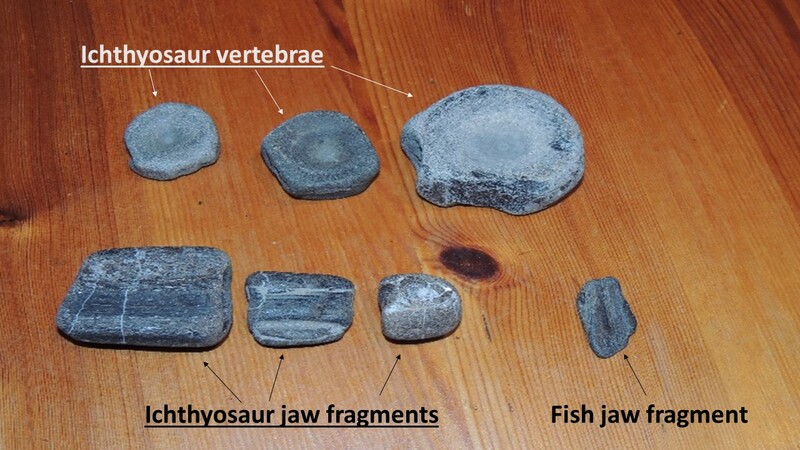 Exciting finds were the more unusual fossils of the marine reptile Ichthyosaur. We found vertebrae and sections of the lower jaw – a small portion of the hundreds of individuals that have been found throughout the Jurassic Coast. We also popped into the Heritage Centre in Charmouth to see the Scelidosaurus dinosaur fossil found at there. Although I couldn’t take a photo of it, for ownership reasons, notice the sign on the wall about the fossil’s burial gives excellent evidence for the Flood! We also visited Burton Bradstock, another fossil graveyard of ammonites, gastropods, bivalves, and brachiopods. This formation was clearly formed rapidly and catastrophically as the bivalves (cockles, clams) have been buried alive – their shells have been fossilised closed. An exciting winter project as many of these still need cleaning up! 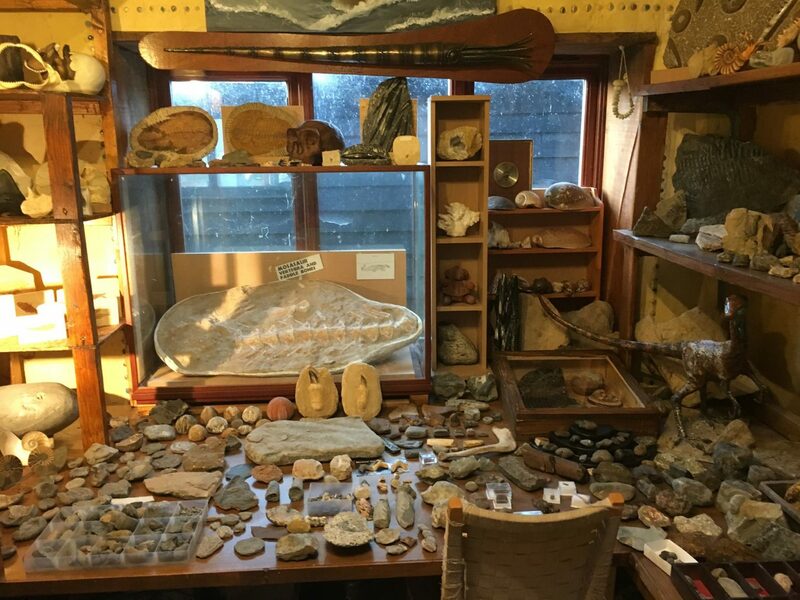 In total we collected over 9 crates of fossils, all showing evidence for the Flood, each with its own story and evidence, which collectively, make an overwhelming case for the global Flood of Noah. The second part of our South coast research trip took us to the Isle of Wight (IoW), the home of Britain’s dinosaurs! This is the best dinosaur fossil location in Europe, and the sixth best location in the world, with over twenty different species found here. All dinosaur finds are found in the Wealden formation – a soft clay-like rock. The secular interpretation for the origin of this formation is somewhat intriguing. Apparently, according to a popular field guide of the geology of the IoW, the formation formed on what is known as the Wealden Floodplain. This was a big basin into which large floods washed sediment, burying and fossilising creatures living there. Even the secular interpretation is in support of a large catastrophic flood. Extreme evidence o f this is found at the Hanover Point Fossil Forest. 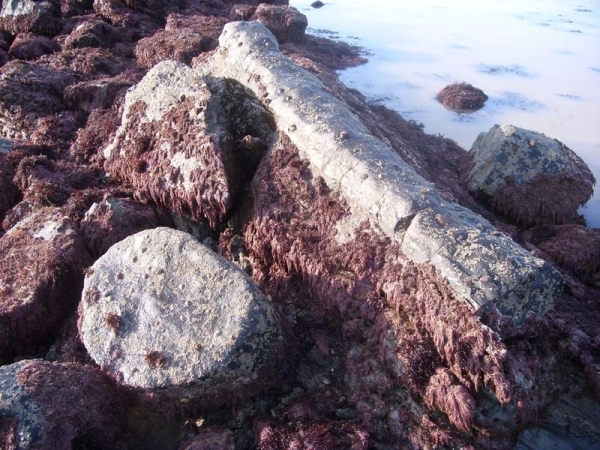 This is a large ‘jumbled mess’ of prostrate fossil logs, clearly washed in and dumped at their current location before being buried and fossilised. 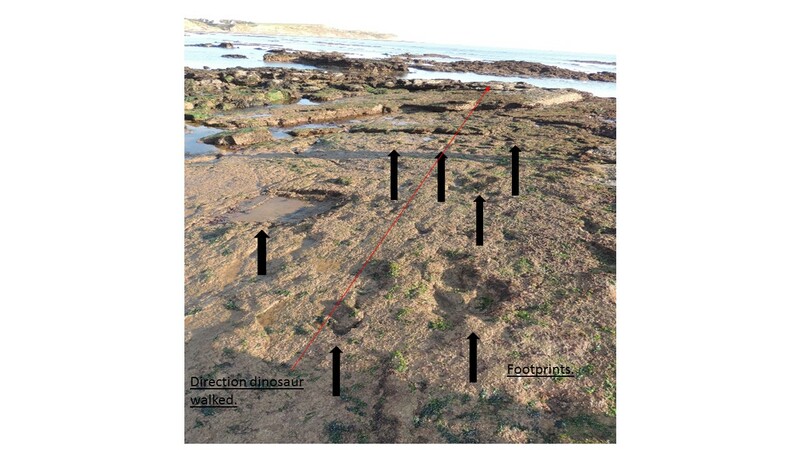 Just beyond the fossil forest are several dinosaur footprint trackways, again, evidence for a catastrophic burial, as footprints don’t last long under normal conditions. Above the Wealden formation is another flood wash-in. It is a hard, thin limestone layer chocka-block full of shells, coprolite (fossilised dung), bone, and even pterosaur (flying reptile) teeth, one of which we found. Another interesting feature were the ripple marks in this layer. They were formed by the action of the water on soft sediment, then buried and preserved. This is clearly rapid burial! One of our most exciting finds was an Iguanodon rib fragment. The exciting part was that it had been fractured and healed while the dinosaur was still alive. The lump on the bone shows where the extra bone has grown as it was healing. Theistic evolutionists claim that dinosaurs lived millions of years before man. However, the Bible clearly states that suffering is a result of man’s sin. Broken bones are very painful, especially if not treated. This dinosaur clearly went through a lot of pain. How then, could this dinosaur have suffered millions of years before mankind existed if pain and suffering came after man was created? This only makes sense within a literal interpretation of Genesis; that pain and suffering only came after sin, so dinosaurs lived alongside man, therefore – no millions of years! Theistic evolutionists claim to respect God’s Word, however they completely undermine it from the beginning. In the words of the man who began the reformation, “It is not true, as several heretics and other vulgar persons allege, that God created everything in the beginning, and then let nature take its own independent course, so that all things now spring into being of their own power; thereby they put God on a level with a shoemaker or a tailor. This not only contradicts scripture, but it runs counter to experience. When Moses writes that God created Heaven and Earth and whatever is in them in six days, then let this period continue to have been six days, and do not venture to devise any comment according to which six days were one day. But, if you cannot understand how this could have been done in six days, then grant the Holy Spirit the honour of being more learned than you are.” – Martin Luther. How true the words of this man are! Let us not undermine the true Word of God, but stand strong on its firm foundation! Previous Previous post: Fast Fossil Facts! Genesis Museum of Creation Research Research trip Report.